I had to bust out my cassette player to listen to Hayley and the Crushers’ new four-song EP Gidget’s Revenge, which they released on tape! Who does that? The collection of beachy, tongue-in-cheek surf rock songs is punkish, head-banging, garage rock fun with loud guitars, thundering drums, and Hayley’s sassy brassy vocals. Fronted by New Times’ food diva Hayley Thomas (aka Hayley “H-Bomb” Cain), the Crushers are the latest of her many musical endeavors. She’s also part of the Tarweed Two, a country duo with her husband Reid Cain, a frequent New Times illustrator and owner of Dr. Cain’s Comics and Games; and she’s lead guitarist of the punk ensemble Magazine Dirty. She’s shared sweaty stages with punk gods FLAG, Jello Biafra and the Guantanamo School of Medicine, Agent Orange, The Weirdos, and Seven Seconds, as well as modern greats Tijuana Panthers and Shannon and the Clams. CANNONBALL CONTEST! 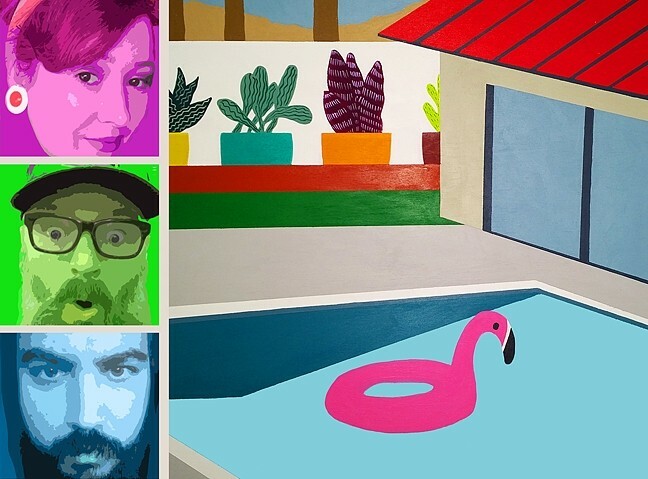 : (From top to bottom, left) Hayley “H-Bomb” Cain, Dr. Reid “Crusher” Cain, and Gabriel “Crusher” Olivarria are Hayley and the Crushers, playing Sally Loo’s on July 23, in conjunction with an art show of Neal Breton’s pool-themed work. The Crushers’ EP is on local label Lost State Records and recorded by Certain Sparks Studios in Lompoc with the sort of lo-fi glory one would expect from a cassette, … or maybe my tape player’s heads need to be cleaned. It’s been a while, you know? “We’re working on our full-length and it will be available by September 2016 in time for a West Coast tour,” Hayley promised. DJ Mano Gil will be spinning Northern Soul, ’50s and ’60s rock, French pop, and other retro sounds before and after the Crushers’ sets, and Bessy the Foto Bus will be on hand for you to capture your good side. Prizes will be awarded for the best “Beach Goth” and “Beach Bunny” costumes. This free, all-ages event starts at 5 p.m. and runs until 8:30. Called “Summer Crush,” more details are on Facebook. FAIR MAIDEN: Former Black Eyed Peas singer Fergie brings her solo act to the California Mid-State Fair on July 22. It’ll be up to 101 degrees on Friday, July 22, when Fergie, formerly the Black Eyed Peas vocalist, plays the Grandstand (7:30 p.m.; all ages; $36 to $81). The eight-time Grammy Award-winning, multi-platinum artist announced that she’s been in the studio working on the follow-up to her 2006 solo album The Dutchess, which debuted at No. 2 on the Billboard Top 200 and spent 94 weeks on the chart. Expect her to play her hits and new material. On Saturday, July 23, the hottest day of the week with a forecasted 105 degrees, country star Blake Shelton plays the Grandstand with Caroline Kole opening, but this show is currently sold out unless you want to go to one of those “resale” ticket sites. One had tickets from $141 to $245. Another had tickets from $159 to $277. Search the web and drain your bank account. The Hollywood Vampires are Alice Cooper, Joe Perry, and Johnny Depp, and they’ll play the Grandstand on Monday, July 25 (7:30 p.m.; all ages; $36 to $81; 96 degrees). They made their worldwide television debut on the 58th Annual Grammy Awards. At the fair, expect an energetic concert and songs like their new single “Bad As I Am” from their new album, as well as renditions of popular classics including “My Generation,” “Whole Lotta Love,” and a “School’s Out”/“Another Brick in the Wall” medley. On Wednesday, July 27, flash back to the ’80s with Duran Duran, a band so nice they named it twice, with opening act CHIC (7:30 p.m.; all ages; $41 to $116; 95 degrees). According to a recent press release, “Regrettably, keyboardist Nick Rhodes will be leaving the current Duran Duran tour … for a short period of time, to return to the UK to attend to an urgent family matter. Standing in for Nick will be long-time friend and collaborator, artist MNDR.” Expect old hits such as “Hungry Like The Wolf,” “Rio,” “Girls On Film,” “The Reflex,” “Ordinary World,” “A View To a Kill,” “Save A Prayer,” and “(Reach Up For The) Sunrise,” as well as new material. Visit midstatefair.com for a complete listing of the fair’s concerts on its various stages. Many shows are free with your fair admission. 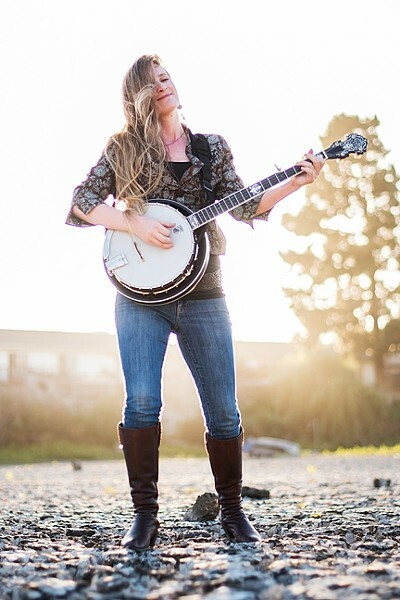 BANJO BABE: Santa Margarita-based banjoist and songstress Erin Inglish plays a free Tooth & Nail Winery concert on July 22. Good Medicine Presents kicks things off this week with a concert by Santa Margarita-based banjoist and songstress Erin Inglish on Friday, July 22, at Tooth & Nail Winery (5:30 p.m.; free). Inglish writes beautiful socially conscious songs featuring lush vocal harmonies, fearless picking, and amazing synergy and collaboration with her rotating collective of guest minstrels. She tours frequently by bicycle, and she’s also known for her annual Banjo Babes pin-up calendar and CD, which features photos of female banjo players and a CD compilation of their material. She’s also wicked cool! Good Medicine Presents and Tooth & Nail Winery return next Thursday, July 28, when they host an acoustic evening with Blind Melon singer Travis Warren, guitar genius Zane Carney, and special guests (6:30 p.m.; all ages; $10 presale at ticketfly.com or $12 at the door). Warren was a member of local super group Rain for Rent until he was tapped to take over for original Blind Melon frontman Shannon Hoon, who died of a drug overdose in 1995. When the band finally decided to reform in 2006, they tapped Warren. Carney is a terrific guitarist and singer-songwriter, known for his work with John Mayer and Broadway’s Spider-Man: Turn Off The Dark. He’s played with Stevie Wonder, Keith Urban, and Roy Hargrove, he’s appeared on Oprah, Ellen, and David Letterman. The new SLO Brew continues to bring some cool acts to the new Higuera Street location. This Friday, July 22, check out Leilani Wolfgramm (9 p.m.; 18-and-older; $12 general admission or $25 VIP balcony at slobrew.com). She’s an Orlando-based singer-songwriter with Tongan roots, who also plays with her brothers Zech and Nasur in their reggae band Hor!zen. Rock steady act Animo Cruz opens the show. SHE WOLF : Singer-songwriter Leilani Wolfgramm brings her breezy reggae sounds to SLO Brew on July 22. Sister Sparrow & The Dirty Birds close out the week on Wednesday, July 27, (8:30 p.m.; 18 and older; $15 general or $25 VIP balcony) with a dose of their patented R&B. Born in the Catskill Mountains and coming of age in New York City, this hard soul collective will get you bouncing. KOLARS, featuring a guitarist and tap-dancing drummer, will open the show. 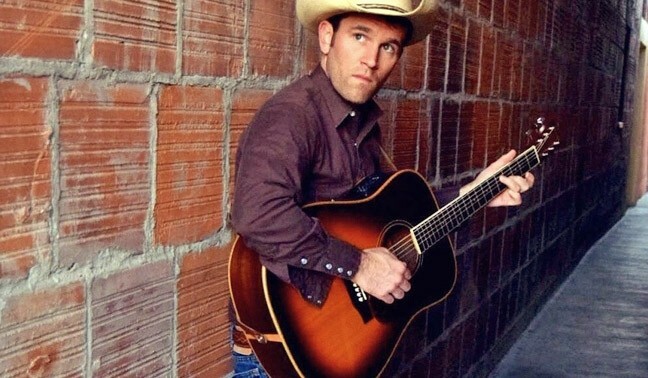 CRY ME A RIVER: Texas troubadour Trevor McSpadden returns to the Central Coast to fill your beers with tears on July 22 at Barrelhouse Brewing and July 23 at Otter Rock Café. Alabama-based one-man-band Albert Simpson plays the Otter Rock Café this Thursday, July 21, from 7 to 10 p.m. Using a tambourine and a porchboard, which sounds like a kick drum, he plays guitar and sings, creating a deep fried Southern back porch sound. Texas troubadour Trevor McSpadden returns to the Central Coast to fill your beers with tears and promote his new album The Only Way. He got his start in Central Texas before heading to Chicago and establishing himself in the alt-country scene. West Coast guitar-slinger Dave Gleason will join him on Friday, July 22, at Barrelhouse Brewing (5:30 p.m.; all ages; free) and Saturday, July 23, at Otter Rock Café (8:30 p.m.; all ages; free). Wolff Vineyards Summer Music Series features singer-songwriter Ynana Rose this Friday, July 22, from 5:30 to 8:30 p.m. Enjoy some vino and Ynana’s blend of contemporary acoustic Americana music. Kenny Blackwell will join in on mandolin and guitar, and BanjerDan Mazer on banjo and dobro. Food will be available from Big Joe’s Brats. OH MAMMY! 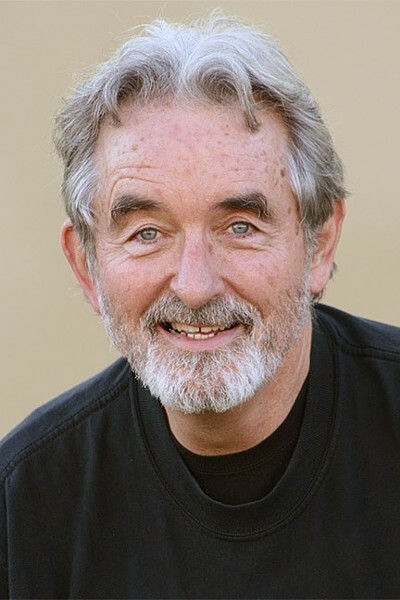 : Broadway performer Gale McNeeley will present “Songs Our Mothers Sang” on July 23, in the Steynberg Gallery. The Cliffnotes return to D’Anbino Cellars this Saturday, July 23 (8:30 p.m.; 21-and-older; $10 tickets; call 227-6800 for reservations). “We’re back by popular demand,” bandleader Cliff Stepp said. “Must have been those wig hats we handed out at our last show! Put on your high-heeled sneakers and wear your wig hat on your head. If you do not have a wig hat, one will be provided by The Cliffnotes.” There’ll be plenty of great boogie and blues music by this swampified ensemble. WIN ME! 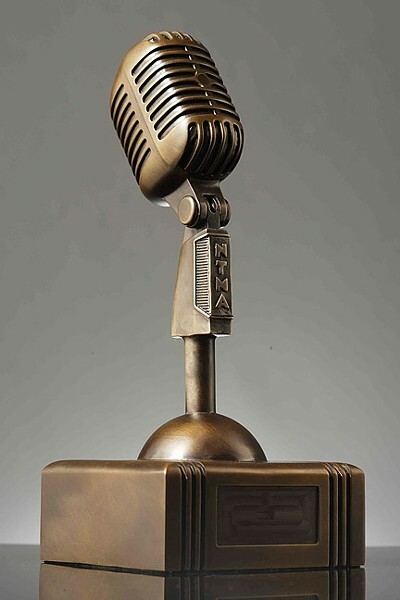 : Enter the New Times Music Awards July 28 through Aug. 22 to win one of these bronze Newties! The eighth annual New Times Music Awards will begin accepting submissions to this year’s contest next Thursday, July 28, through Monday, Aug. 22. You can enter the songwriters’ contest, submit songs in the various genre categories, or submit an album for the Album of the Year contest. Our panel of judges will decide the winners, who will be invited to play the awards show on Friday, Nov. 11, in the Fremont Theatre. You’ll find entry forms in the next four issues of New Times, or enter here online. And good luck!